Here’s a look at what you’ll learn by attending a seminar with one of our Google Analytics Certified Partners (GACP). Whether you’re just getting started or have been involved with Google Analytics for a while, if you’re looking for a thorough training in all of the reports Google Analytics provides, this is the course for you. First, you’ll get a detailed background in the web analytics industry. Then you’ll go through a detailed examination of all of the reports Google Analytics has to offer, with real-world examples of how they can help you. You’ll also learn how to segment your site’s users, spot key trends, and of course, how to take your web analytics data and use it to your advantage. If you’re already familiar with the basics of Google Analytics and are looking to become more sophisticated in your analysis, this course will show you how to do just that. Whether your business goals are user engagement, lead generation, or e-commerce, you’ll benefit from learning how to use the most advanced analysis features of Google Analytics, like Intelligence and Advanced Segmentation. For those who are comfortable with Google Analytics but want to dive deeper into the technical side of GA, this advanced technical implementation course is for you. This training is tailored a bit more toward the tech-savvy, but is extremely valuable to anyone who wants to learn what Google Analytics can do when taken beyond the “plain vanilla” implementation. You’ll go “under the hood” of Google Analytics and learn about filter configuration and setup, opportunities for advanced, custom implementations, as well as the newest beta features that are rolling out. Once you’ve nailed down your Google Analytics implementation, you’re ready to start taking action on your data by testing your website. This interactive training in Google Website Optimizer teaches you how to test your site to improve your users’ experience and your business’s bottom line. Attendees will receive a strong background in landing page testing and testing best practices, many real-world case studies, and an optional, hands-on lab experience in starting both A/B and Multivariate tests. If these dates don’t work for you, see the complete Seminars for Success schedule. Google Analytics and Google Website Optimizer Seminars for Success are a great way to get in-depth, hands-on training on two products that can help you maximize your marketing and website ROI. Seminars are available coast-to-coast all summer long. Starting in June, we have three sets of seminars being held in New York, Phoenix, and Chicago. Sebastian: "Google Analytics can save you money! Use it to figure out what works with your online marketing, invest in that, and throw out the rest. This is the focus of our new title on Google Analytics geared toward business people and online marketers with an eye toward the bottom line." Avinash Kaushik pitched in with a Forward, writing: "The key to real and magnificent success is not the ability to purchase a tool... but rather the ability to ensure a clean implementation and bring to it a mental model that will rock this world. This book is focused, page after detailed page, on doing just that." Track and optimize social media, SEO, email and offline campaigns. Maximize ROI on your marketing spend. Build a strong team to support Google Analytics inside your organization. Get more from your Adwords campaign. Use the web to understand what customers want. Create customer loyalty on your site. Use feedback from users to guide online strategy. Caleb went further into depth on the contents: "This book tackles the delicate challenge of teaching how to think as well as what to do. The first section focuses on the philosophical, managerial and organizational aspects of succesfully utilizing web analytics technologies to drive greater marketing performance. The second section covers the end-to-end of how to plan, install, configure, and use Google Analytics to its fullest capability. The final sections then covers application of the concepts and capabilities from the first sections to specific marketing disciplines - site optimization, display and sponsored search ads, organic search engine optimization, offline, email marketing, and more. The end result: learn how to think, get guidance on setting up Google Analytics correctly, and then discover practical steps to drive higher performance from all aspects of marketing." Thanks guys, and great work. 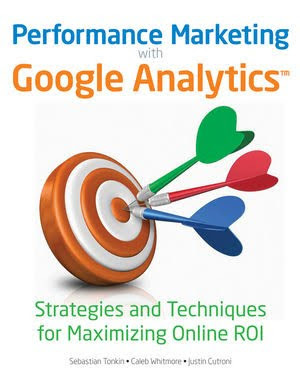 Grab a copy on Amazon or find out more on the book's companion site, www.analyticsformarketers.com. and we answer them. We had lots of fun putting this episode and we hope you get a kick out of watching it. Here is the list of last week’s questions. Is there a place to share Google Analytics code snippets and regular expressions? If you found this post helpful, we'd love to hear your comments. Or, please submit a question or vote for your favorite question in our public Google Moderator site and Avinash and I will answer the newest batch in a couple of weeks with another video. This is the 9th exciting episode of Web Analytics TV with Avinash Kaushik and Nick Mihailovski, where you ask questions about web analytics via the Google Analytics Google Moderator site and we answer them. We had lots of fun putting this episode and we hope you get a kick out of watching it. Here is the list of last week’s questions. We’re committed to Google Analytics as an industry-leading web analytics platform that also provides users with transparency and choice when it comes to privacy. Many website owners use Google Analytics and other web analytics tools to make business-critical decisions about how to improve their websites by understanding how users engage with their webpages. We’ve worked hard to make Google Analytics both a robust and reliable web analytics platform while also ensuring the trust and privacy of visitors of these websites. Today we’re taking additional steps to provide even more choice and transparency for both website owners and users. , which came out of beta last week, is now available in your admin interface when you set up a new profile. This makes it easy for everyone to start off tracking new sites with this very fast, state-of-the-art tag. Whether you’re tracking a single domain, or a more complex site with multiple subdomains or top level domains, there’s an option in the interface to give you exactly the code you need. Simply select the scenario that fits your needs. The admin interface now provides the asynchronous tracking code by default, but if you need the traditional tracking snippet you can find it here. We also encourage you to upgrade your existing sites to the new tag. To help you, we’ve created complete instructions and migration examples. Enjoy your new, faster site! We’re happy to announce that the asynchronous tracking tag, which came out of beta last week, is now available in your admin interface when you set up a new profile. This makes it easy for everyone to start off tracking new sites with this very fast, state-of-the-art tag. Last month we held 3 successful Google Analytics Master Classes in Singapore, Kuala Lumpur, and Sydney. We were pleasantly surprised by the sheer amount of interest in web analytics in this region with close to 1000 advertisers, agencies, bloggers, developers, and technophiles attending the events. For those of you who made it out, we thank you for your participation and interest, and hope you gained valuable insights from our all star team of speakers. The videos of all the talks from the Singapore event are now available. Each session was kept deliberately short - no speaker goes on longer than 20 minutes - in order to maintain the audience’s interest and to keep the topics flowing at a good pace. Therefore, each video is a good length to watch during work, on break, or at home, enriching your Google Analytics knowledge in convenient bite-sized portions. Above is Beth Liebert’s (Google Analytics Product Manager, Google) keynote on web analytics. Please surf on over to this post on the Solutions for Southeast Asia blog for the full list of the videos. about our .NET client library and requesting sample code. So we’re happy to announce we’ve updated the .NET Google Data client library to support all our recent features. In addition, we’ve added 2 reference examples for both the Account Feed and Data Feed which show how to pull advanced segment, custom variable, and goal data from the API. As you can see from the examples, this client library makes pulling data from the Export API incredibly easy. Now that the .NET developers among you have this library, what will you use it for? Fancy visualizations? Automated reporting? Extreme data mining? Let us know in the comments, or bounce a few ideas off your peers in the GA Data Export API group! We’re incredibly proud of the diversity of applications and tools making use of the Google Analytics Export API. We also know that several of the folks developing these tools have been asking about our .NET client library and requesting sample code. and developer programs. To celebrate we are highlighting some of the exciting solutions that extend Google Analytics in our new Google Analytics Application Gallery! AnalyticsApp is an app for Google Analytics on the iPad! The Referrer Flow visualization shows you what sites link to you and which content works best. The Keyword visualization displays the most frequently used search keywords and how they are used together. BTBuckets is a free segmentation and optimization webapp that allows sites to create user segments and take actions upon them in real time. CallTrackID allows telephone enquiries to be tracked from various traffic routes, including direct, organic, PPC ad, affiliate and offline straight into Google Analytics. ShufflePoint Studio allows you to associate PowerPoint text, table, and chart placeholders with refreshable Google Analytics data. The App Gallery makes it easy for customers to find 3rd party solutions that extend Google Analytics in new and useful ways. We also think it’s a great way for developers to find new users and attract more customers. If you’re a developer and you’d like to have your application listed in the gallery, we've created a simple submission form to get your app added. Finally, if you’re interested in learning more about how you can integrate with Google Analytics, join us for our presentation: Google Analytics: End-to-End on May 20th at Google IO. It’s only been a year since we launched the Google Analytics Data Export API and developer programs. To celebrate we are highlighting some of the exciting solutions that extend Google Analytics in our new Google Analytics Application Gallery! in San Jose, Brett Crosby made several announcements that highlight this ecosystem. All Google Analytics customers have access to a worldwide network of Google Certified Partners (formerly known as Google Analytics Authorized Consultants). And now the ecosystem is growing further with developers who are creating a variety of applications on the Google Analytics platform. Today, we’re announcing the Google Analytics App Gallery. Among the current list of 32 apps, you’ll find tools like Excellent Analytics, which lets you work with your Analytics data in an Excel spreadsheet, and the Analyticator for Wordpress, which automatically implements Google Analytics across your entire WordPress site. There are many more applications in the gallery, so go take a look. And if you’re a developer, you can learn how to publish apps in the App Gallery here. Google AdWords is another important part of the ecosystem. Website owners drive traffic using AdWords, and use Google Analytics to understand the performance of that traffic. Over the coming weeks, we’ll be making a new set of AdWords reports available in Google Analytics. These reports expand significantly on the AdWords reports you currently see in your account. For example, you can break out your AdWords traffic by actual search query, match type, distribution network, and many other AdWords attributes. We’ve added reports for day parting, placements, and destination URLs. For a 3-minute overview of what you can accomplish with the new reports, check out this video. Also, developers can now access AdWords information via the Google Analytics APIs. This makes it much easier to combine your AdWords and Google Analytics data for both analysis and automation. We’re very excited to see third party applications that use this capability to offer new functionality to advertisers. For details, check out this article, which includes a code sample and more, on Google Code. Also part of the AdWords/Analytics ecosystem, AdWords Search Funnels was announced one month ago, and today is available in all AdWords accounts. We’re also making two short tips videos available (tip 1 and tip 2) that illustrate just a couple of the ways you can use Search Funnels. 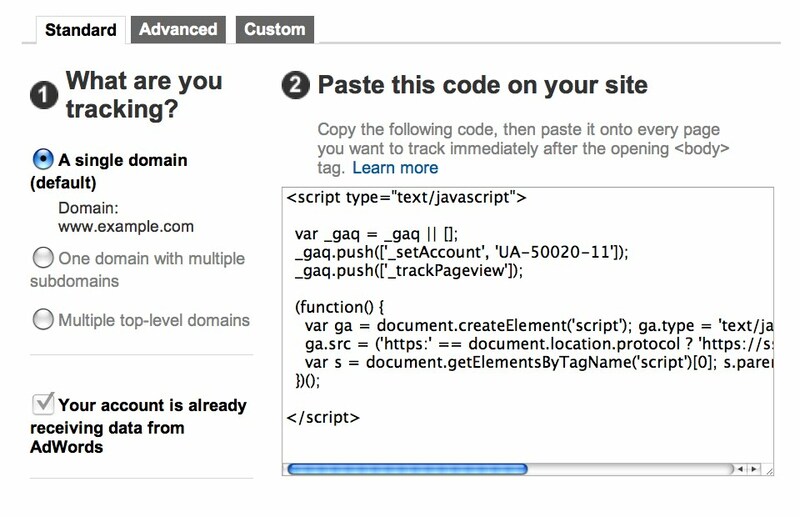 Finally, supporting the ecosystem of all websites using Google Analytics, the new faster page tag comes out of beta. The asynchronous tracking snippet will soon be the default snippet when you set up a new profile. This new page tag will speed up your site and every site that uses Google Analytics across the web. 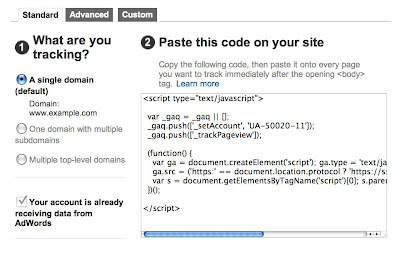 If you want to upgrade from your existing tag (which we highly recommend), you can learn how to do that here. We'll follow up with deep dive posts on each of these topics next week. Thanks for being part of the ecosystem. Google Analytics is not simply a product but also a growing ecosystem of developers, tools, users, and partners. Today at the eMetrics Summit in San Jose, Brett Crosby made several announcements that highlight this ecosystem. If you are looking for help with your Google Analytics account, look for companies that display this Google Analytics Certified Partners logo. Companies displaying this logo have met our rigorous requirements demonstrating a level of expertise, agreed to our terms and conditions, and have proven experience to work with you. Yes, we’ve made them jump through hoops because it’s important that we vet the best to service you. We don’t take it lightly because optimizing your Google Analytics account is serious business. So, whether it’s a quick consultation, help with an implementation or tracking a campaign, or long term support or training - look for companies that display the new logo. The new logos include a "Click to Verify" element that takes you to a listing on our partner page for more information. You can find the latest list of Google Analytics Certified Partners here. The new logo is part of our plan to produce consistent naming and badging for all Google product partner programs. Your friendly neighborhood Google Analytics Authorized Consultant program is getting a new costume and superhero name, though their powers will remain the same. (Read: we are renaming the program and with that comes a shiny new logo - we think of our partners as superpowered).